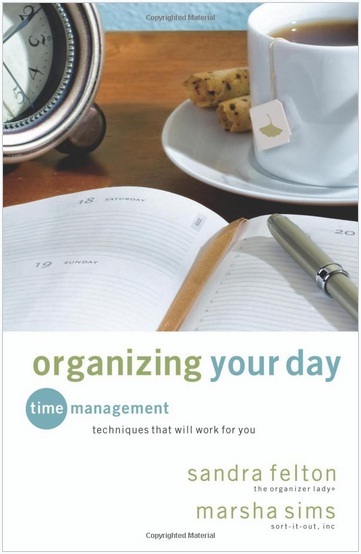 Just 1 Step: Organizing Your Day - Read It! Over the past week I have been reading the book "Organizing Your Day: Time Management Techniques That Will Work for You" by Sandra Felton and Marsha Sims. my days are a whirlwind and I can't get everything done. No seriously. I have no pattern to my days at home. I fly by the seat of my pants. And I'm trying to do too much. I try to do too many little things that are unimportant, but in my perfectionistic tendencies I think I should be able to squeeze them into my day. And beyond that, I am way, way, WAY too distractible. This book is helping me learn to notice my distractions and try to move past and ignore them. OH, I think I have the same problem! I'll have to look this book up. Very good to read when you feel overwhelmed by the time-consumption of your child!! You should read it Joyce! I might! After the other 50 books or so in my stack. :p My sister got me Organizing Magic by Sandra Felton many years ago. I need to read that one again too.